“Kärlek var sann. All annat var lögn”, it says on the film poster: “Love was true – all the rest was a lie.” What’s more intriguing than a mad love story with my newly found fav Swedish actor Mikael Persbrandt ? A story about star crossed lovers always is…. As director Simon Kajiser da Silva told us, the classic Romeo and Julia setup wouldn’t work nowadays. So what would be a truly doomed combination? This is: Imagine you fall in love with the very person who killed your child. 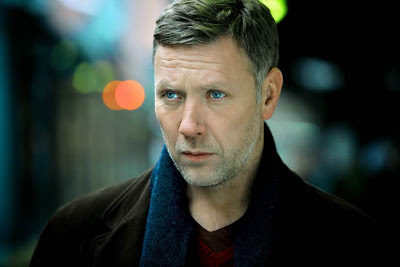 While Johan (Mikael Persbrandt) is riddled with guilt about the tragic car accident – although he was found innocent in court – Anna (Iben Hjejle) can’t get along with her husband any more, because he seems to be eager to wipe away everything that might remind him of Tove, his dead little daughter. Anna instead wants to remember and – upon meeting Johan – acts as if the little girl was still alive. And Johan wants to know about the life he took involuntarily. So none of them tells the truth. Until all the lies fall apart. Great, great film – narrated in Persbrandt’s beautiful basso voice (which in itself sends shivers down my spine). Watch it!